Kathy was born and raised in San Jose. She earned her Bachelor of Arts degree in Psychology from the University of California, Los Angeles (UCLA), and her Master of Business Administration degree from the University of California, Berkeley. She attended seminary at the Church Divinity School of the Pacific, from which she received her Master of Divinity degree in 2001. 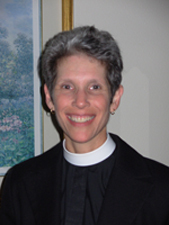 Prior to taking on the role of Interim Rector, Kathy served as Assisting Priest at Church of the Resurrection, and as both Associate and Interim Rector at St. Timothy’s, Danville. Kathy lives in Danville with her husband, Tom. They have four adult children, all of whom live in the Bay Area. She is an avid Bruins fan, and in her free time enjoys reading, watching and playing sports, and flying airplanes.